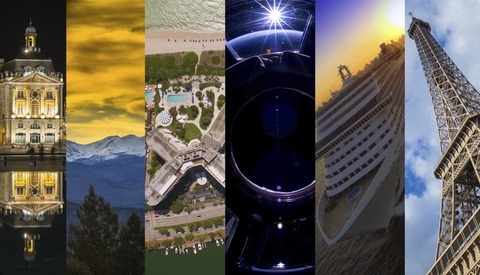 Photographs can cause an instantaneous emotional response; that's what they're good at. So what's stopping you from using that to get people to pay attention to the things that you care about? Back in February, I wrote an article about doing unpaid photography work. In it, I mentioned the option of using your skills for good causes like raising awareness for urgent/imperative issues or providing marketing material for struggling/new NPO's. The list is endless, really, but for me at least, I think it helps to focus on issues that are close to the heart. Yes, you are giving your time and resources to something that won't pay, but this kind of work could get the attention of someone that's willing to pay for your services; you don't know where it might lead to, but what's most important is that it's good for the soul. I just spent two weeks in the African bush photographing some behind-the-scenes of a private conservancy in the hope that my photos can contribute to the protection threatened, vulnerable, and endangered species. I'm back in Ireland now but my head is still in South Africa. The people that I met, the animals that I encountered (sometimes, very close encounters), and the experiences that I had were all nothing short of incredible. As well as having all these wonderful feverish memories, because I got to peek behind the curtain, so to speak, I was able to get a glimpse of the reality of the legal wildlife business. A lot of it is not particularly pretty. For example, private reserves, while fenced off to larger animals, make up the bulk of wilderness in South Africa, and many of these reserve owners allow hunting on their properties. While it may not be many people's ideal vision of conservation, trophy hunting is a reality in South Africa. It's big business in a developed country, and it's money in people's pockets who might have otherwise turned their land into agricultural pastures devoid of any real biodiversity. 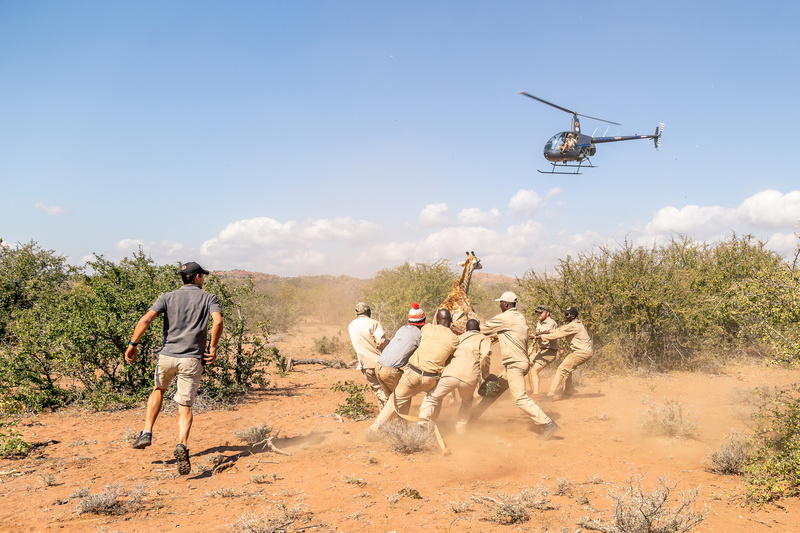 The giraffe was darted from the helicopter hovering above. The ground team then moved in rapidly with two vets to make sure the animal didn't hurt itself. A more palatable side of the legal wildlife industry is the live wildlife trade, where animals are frequently bought, sold, and traded. This includes live game capture which, unfortunately, can be very stressful for an animal but it's important to look at the bigger picture. I got to experience this first-hand and I would be lying if I didn't admit that it was one of the most exciting things that I've ever witnessed and definitely the most exciting thing that I've ever photographed. Distressing, yes, but again, in a place where people need to make a living, the live trade of wild animals is a necessary compromise in order to protect the more vulnerable species. Case in point; the Near Threatened Southern White Rhino and the Critically Endangered Black Rhino. 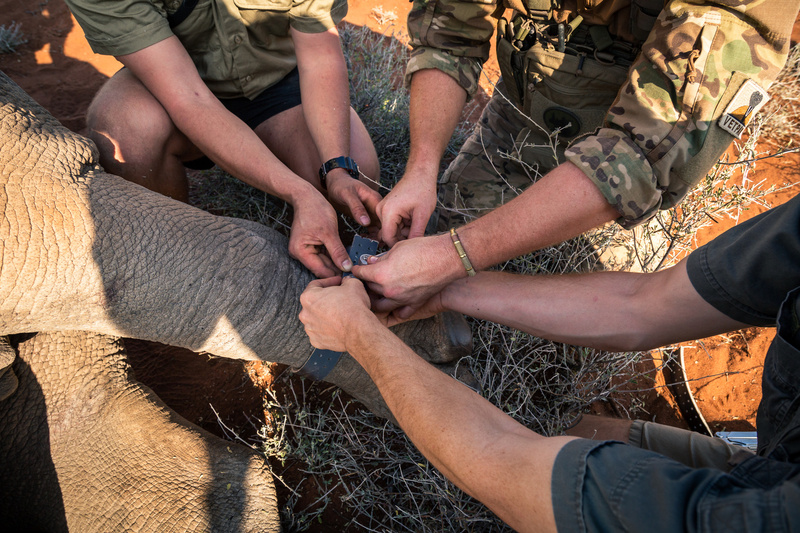 A volunteer, a VETPAW team member, and a conservation ranger work together to put a tracking collar on a White Rhino. 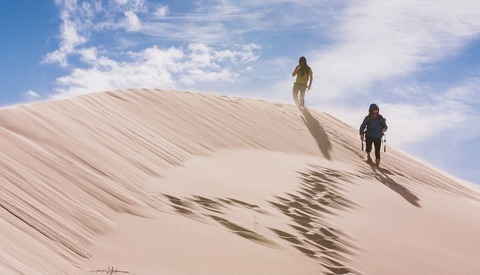 The third model of income that I'll mention and one of the most crucial contributing factors to the protection of wildlife in South Africa and the world over is that of eco-tourism. 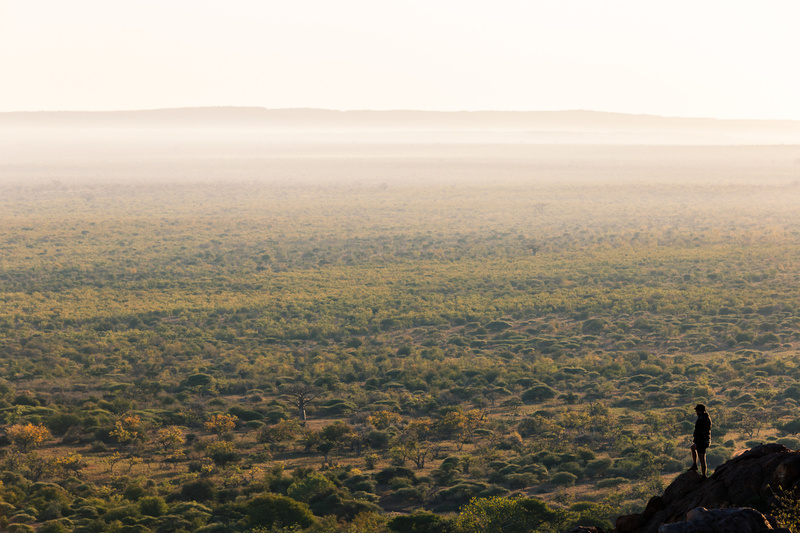 Volunteers pay good money to get a real African Bushveld experience. Conservancies get money to spend on security, veterinarians, and general upkeep, while the volunteers not only get to see these amazing creatures up close, but they also learn about conservation, anti-poaching, and local culture. It's a win-win. 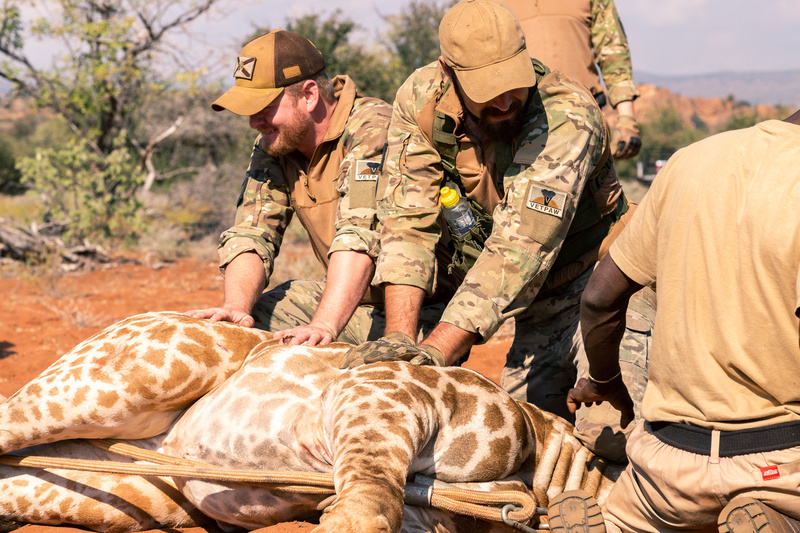 President and Founder of VETPAW, Rayn Tate (left), and his team leader, Trevor, help to subdue a tranquillized giraffe. 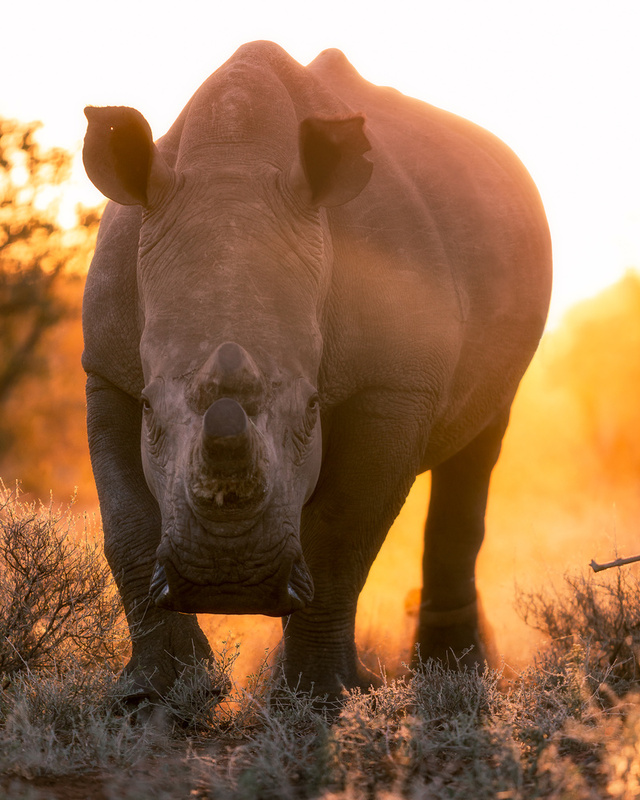 These days, in this part of the world, one of the biggest threats to endangered species like the Rhino is the brutal practice of illegal poaching. You see, a rhino's horn, despite being inert (it's basically a giant fingernail), is prized for its supposed medicinal properties in certain parts of the world, and with a peak valuation of $65,000 per Kg in 2012; it's bigger business than cocaine. That's why the rhinos you see in my photos have had their horns cut off. Once the horn is gone, poachers have no real reason to go after these animals except maybe out of spite. Yes, it's that vicious out there. A de-horned White Rhino moves to get a closer look at the photographer. My first week at the camp, which was built to facilitate a volunteer program, was spent shadowing the man who is responsible for the reserve's rhino conservation program, Níall Beddy. It was a relatively peaceful week where I was able to really get a feel for the place; I slipped into the Bushveld routine. I also got to meet the reserve's anti-poaching unit; an NPO that goes by the acronym VETPAW, which stands for: Veterans Empowered To Protect African Wildlife. 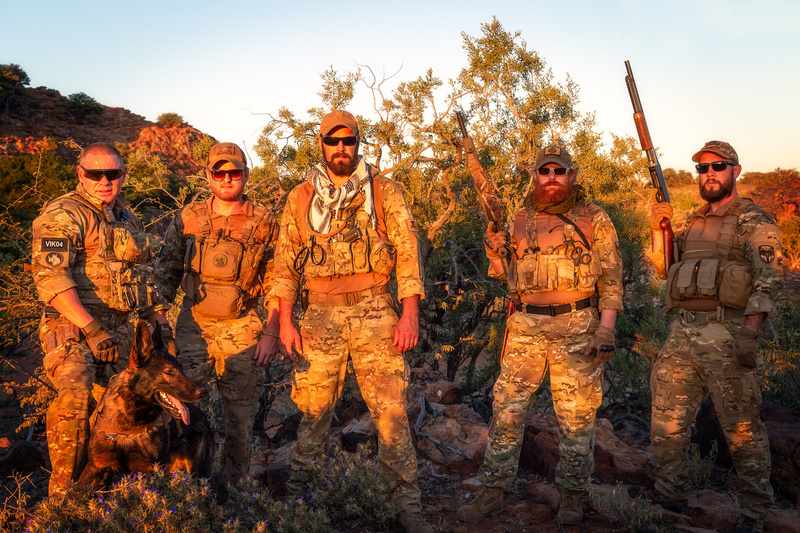 As the name suggests, these guys are US Military veterans who have found a new purpose; a powerful way to apply the skills that they learned in the military to protect vulnerable animals and earn a living for their families. Founded by Marine Corps Veteran, Ryan Tate, the team's responsibilities are numerous, including patrolling the fences, intelligence gathering, and rapidly responding to any suspicious activity. They do have one South African on their team, though; Henry leads their K-9 unit, and his lead dog holds the Guinness world record for sky-diving into an anti-poaching operation. His name is Arrow and he's a very good boy. Guinness World Record holder, Arrow, taking down his target and feeling very good about it. Whether lucky or unlucky, I didn't get a chance to see the guys in action as the lack of rhinos with horns and VETPAW's visible presence seems to be enough to dissuade any would-be poachers, for now at least. Coming into my second week there, and one day after a giraffe capture, some volunteers arrived at the camp. Over the next few days, we were treated to Buffalo capture, Black Rhino collaring, and White Rhino de-horning. It was a busy and tiring week but an incredibly fulfilling experience. However, all was not so positive. The day of the Black rhino collaring, our guide and conservation ranger, Níall, accompanied by an armed VETPAW member, tracked a Black Rhino on foot through the bush for about 20km. 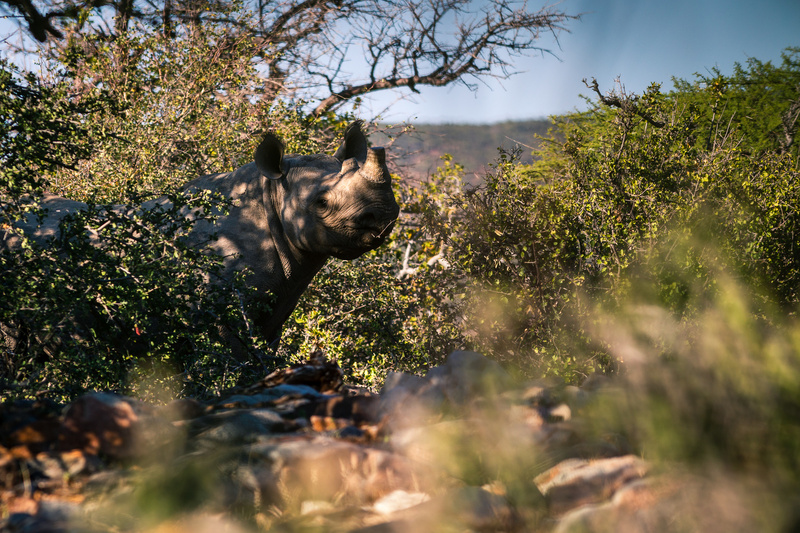 It's a dangerous thing to do as Black Rhinos are notoriously skittish and their fight-or-flight response consists wholly of fight, but it needed to be done as the collars are crucial for keeping track of the animals. After they got a visual, the rhino was tranquilized by a vet from a helicopter and the ground team moved in to take some blood samples and place its new collar on. It was a very successful operation and the team was on a high. But we were all brought back to Earth the next day when we found out that just a few hours drive away, a Black Rhino was brutally butchered by poachers, leaving one rhino orphaned and another youngster maimed. Some of the VETPAW team. From left to right: Henry, Arrow, Ryan, Trevor, Mike, and Ben. The news of the deaths really drove home the reason why all those people were out there. 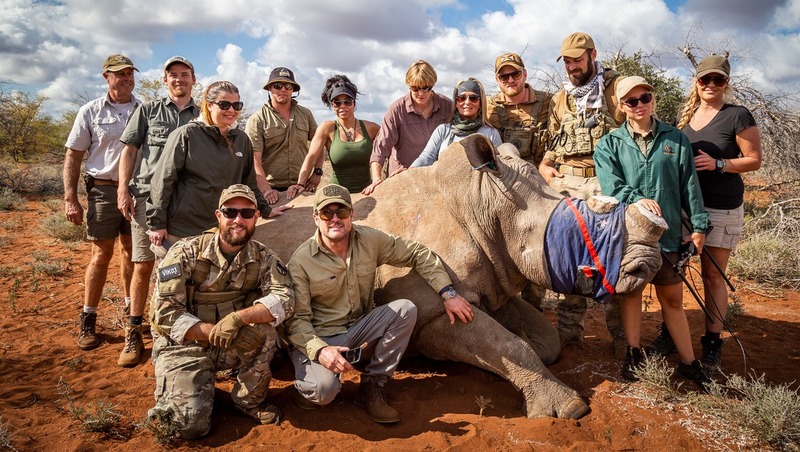 VETPAW, the landowner, Níall and his staff, researchers, veterinarians, volunteers, and to a lesser extent, me; we all shared a commonality and we all felt the shock of the news but none more so than those who look after these animals day in day out. It's thanks to the tireless work of all these people that I was able to capture an image of a wild Black Rhino happily feeding without a care in the world, and thanks to my guide, Níall, it was completely unaware of our presence. Seeing a critically endangered species like this, in the wild, is incredibly uplifting and offers some glimmer of hope in the dark reaches of the African bush. One can only hope that it continues to be so content and so unaware. A Black Rhino none the wiser. My guide and I were litterally shaking when I took this. A few wrong moves and the animal would have charged. What issues do you care about? Have you used your skills for any good causes? Has this article convinced you to try? Please let us know in the comments below. If you would like to donate some money to VETPAW, click HERE. To learn how to get involved as a VETPAW volunteer, click HERE. Very interesting and informative article. I really appreciate your having written it. Thanks, Sam! It's very much an issue close to my heart so I really appreciate the feedback. Fascinating work, and a great write up. Keep fighting the good fight! It's really nice to read this kind of news and knows that have people helping maintain the environment and continuation of species. I would like (and really want) that one day, this kind of stupid action of humanity stop. It is possible to generate capital without threatening diversity, whether of animals or plants. great article Mike! I have been shooting wildlife for fun since a few years (I do shoot professionally but other stuff) and I sell a few prints now and then of which the revenue is donated towards big cat projects in Africa. I would very much love to do something similar like this and help wildlife conservation organisations by donating my time and skills in order to get get them good photo's about their work; do you have any tips on where to start? Great article. There are gobs of areas where this can be applied and then variations on those. Three times as many people per capita are killed on U.S. roads as on those in The Netherlands and other European countries? The U.S. has the highest rated healthcare system in the world yet the highest rates of obesity and preventable disease leading to one of the lowest life expectancies of all developed countries. These two are connected as doctors consistently rank our lack of daily activity from transportation (walking & bicycling) as the number one health problem in the U.S. So, a few of us spend time taking photos of bad road designs that encourage dangerous driving and that make walking or bicycling uncomfortable, unsafe and undesirable due to lack of safe walkways and bikeways. A variation on this is traveling to Tanzania to document their transportation issues and what World Bicycle Relief (https://worldbicyclerelief.org/en/) is doing there to help medical personnel and school children. A friend was just shooting the work of Zipline (http://www.flyzipline.com) delivering blood and medical supplies in Africa. 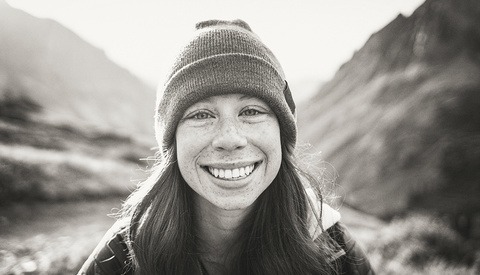 I met a portrait photographer a few months ago who's been documenting human trafficking in the U.S. (we are believed to have among the highest rates of human trafficking of all developed countries). Thanks, Quincy. All very worthy causes. Very interesting, too. I'll have to look into these issues more, myself. Wow, not one person of color! I think it was Rudyard Kipling who wrote a poem about what it entails to be white.